The Confusions have always been writing a lot of songs but this year they will break all barriers as they will release two albums. First out is their “acoustic” album. Since few years Mikael and Zarah have done acoustic gigs with just guitar and accordion but last year they did a lot of acoustic gigs, sometimes with the whole band and sometime with just a few members. The acclaims have been stunning. The low key gigs seem to add new depths to the songs and the reviews have been fantastic. Ever since they started doing these gigs they have been asked if these acoustic versions could be available. So during the sessions for the new album they sneaked in at Domsaga studio to record 15 songs live in these versions of which 11 made it to the album. “It Sure Looks Like The Confusions But It Sounds More Acoustic” is now being released in the USA by Listening Post Music, only available in a limited edition of 1000 copies. Watch out for the brand new studio album in the fall. Lots of gigs also this year – UK, Russia is confirmed and an US tour is in planning]. 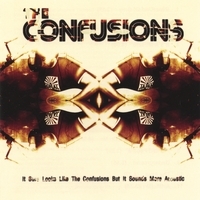 The Confusions have released five albums, including Trampoline, Being Young and 5 AM, received good reviews in Rolling Stone, Melody Maker, Record Collector and have also frequently toured US, Europe, the Baltic states and Russia. Also check out other Confusions music - Trampoline, Being Young, 5AM, The Story Behind the Story, and Don't Let The World Catch You Crying.